She loved him. It was obvious that she did. And he loved her. It was awe-inspiring to see. It made those around them believe in love all over again. They had worked together at an engineering firm for years. They knew each other very well and had a great life planned with each other. However, there was one slight problem… he took another job with an oil company and was being relocated to Oklahoma. This put the wedding plans into high gear after she agreed to move with him. Their wedding planning had a few hiccoughs in it. 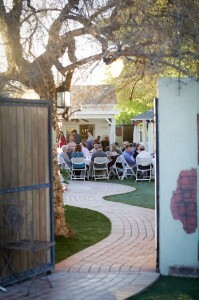 Their original venue had double booked their date and sent them packing with only a few months to plan another event. I got a panicked call from a bride on the edge, but we got them squeezed in and everything was back on track. Not only were they planning a wedding, they were planning a major move and major change in their lives – all at the same time. Normally one of these would put the bravest of women hiding under the bed, coming out only to pee and restock the chocolate supply. She was doing a good job keeping everything together, yet moving forward at the same time. The wedding was beautiful. The bride blushing. The groom doting. The food was delicious. The cake was an attraction. The DJ was keeping the mood festive. Everyone was having a great time – especially the bride and groom. Then the first guest left. It happens. The babysitter is getting paid by the hour. Someone has to get up early in the morning, so they cut the evening short. There’s any number of reasons that people will leave a wedding reception early. But it happened. And it was a shock. It wasn’t a shock to me or the guests leaving, but to the bride, it marked the beginning of the end. She clung to them like they were life vests on a treacherous sea. Then the tears. And more tears. And yet more tears. The party went on, yet the party was over. At least for the bride. She stood by the gate as each guest tried to leave and hung on them with the fervor of the first victim. I was heartbroken for her. It was horribly sad to watch. Not knowing what to do, I went to tell the groom what was happening. Apparently it was too much for him, too, but didn’t want to be taken away from HIS friends. So, this lovely, sweet couple that had the wedding day of their dreams – then suffered major heartbreak that night as they said good-bye to everyone. I’m sure it seemed like a good idea at the time, but as it turned out – it wasn’t such a good idea after all. Virginia’s House, the historic CH Tinker home is no exception. 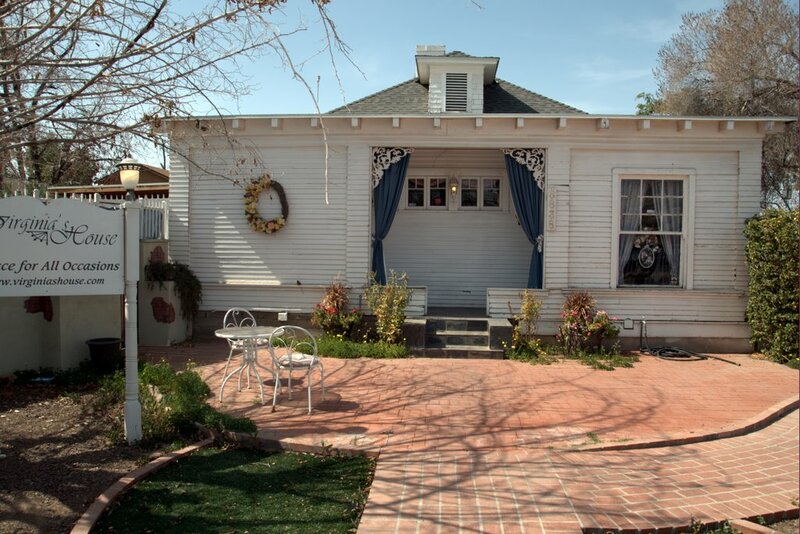 It was the original home built in this neighborhood in 1913 – in fact, it’s legal description is “orchard lot 1”. Many homes were built in the decades to follow using materials not typically used any more – mostly wood siding (the Arizona sun is too hard on it). Add 99 years, multiple economic swings, newer neighborhoods being built further out and these little, tiny, wood sided homes become obsolete. They also become “ugly” to those who are used to looking at large, rambling, stucco, new-builds. And after 60, 70 or even 80 years of being “not good enough”, they start to look pretty bad. I have had several potential customers do what we refer to as “drive-bys”… meaning they find us online, fall in love with our photos and great reviews, set-up an appointment, drive into the area, then change their mind and leave me waiting without coming in. To these folks, I apologize. To others that haven’t made that drive yet, I ask you to come inside. The CH Tinker home was built with all of the opulence of 1913 – complete with a music parlor, butler’s pantry, built-in china cabinet and electric lights – all of which are still intact. 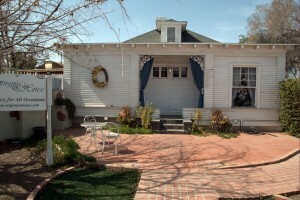 The home itself is just under 3,000 square feet – a good-sized home for current standards; a mansion at 1913 standards. My husband and I have spent the last 15 years lovingly restoring this home – not renovating – restoring. Restoration is a laborious task that requires more attention than gutting and replacing, not to mention more time and money. We have done our level best to return this beautiful home to it’s original splendor. As of this writing, I have been in business for almost 14 years. It’s a business I started from nothing, but an old house and a dream and grew it into many happy occasions and lifelong friendships with my brides, their families and friends. Many people may not know this, but it is also my home – we have lived here since 1997 and I have raised my two children here. As hard as I try not to take it personally – sometimes I still do. I have labored over, celebrated and cried into every corner and crevice of this home. I have befriended my elderly neighbors and buried most of them. I was their breath of fresh air when we purchased the property and gave them hope for new things to come. Virginia’s House has been good to me. And them. And I want it to be good to you. So I ask you this… we have been told all through our lives not to judge a book by its cover. I would ask that you not judge THIS book by the other books on the shelf. There’s a great story written here and I’d like to add your chapter. Our bride was meticulous in her planning. We had several meetings on how things would go. We discussed color in depth and carried color swatches out into the sun to make sure they were still the same color. The rehearsal was carried out with military precision and the ‘to do’ lists were distributed to each bridesmaid and groomsman after the rehearsal with stern words on how they were to be carried out. Don’t get me wrong, the bride was not a bridezilla on any level. She knew what she wanted and delegated with the efficiency of upper management. She was very sweet to work with and had a handle on everything. Fast forward to her wedding day…. Bridesmaids arrive and immediately jump into the functions of getting dressed in the bride’s room. The groomsmen arrive, diligently sporting the items they were enlisted to provide. The musicians, minister, photographer, etc. were all filing in at their designated times. As the coordinator, I was keeping my finger on the multiple pulses going on around the property. But the one heartbeat missing was the bride’s. Without sounding any alarms, I would casually ask the bridesmaids if anyone had heard from her. No. I asked the groomsmen if everything was going okay. Yes. The bride’s parents arrived. No bride. I asked if they knew where she was. No. The buzz of the day continued moving on and getting louder with every passing minute. Once again, I started the rounds of asking if anyone had heard from her. I called her cell phone. No answer. Now I’m starting to wonder if she’s coming at all. And if not, why? Did she run? Did something terrible happen? Should I sound the alarms? The wedding start time was approaching quickly. The clock ticked louder and louder in my head, yet nobody seemed alarmed at all that the bride was nowhere to be found. It’s 6pm. Start time. Now we’re at critical mass. I’m standing in the main room wondering what my next move is… Do I go to the groom and tell him his bride isn’t here? Do I ask the bridesmaids one more time to call her? Do I put her mother into a panic by suggesting that something might be wrong? Then something moved out of the corner of my eye. I turned my head towards it. I bent down to get a better look out of the front window. There it was. A big yellow taxi. And a VERY mad bride. Before I could formulate a sentence, she barreled through the door, two fists full of wedding gown and said, “Let’s do this before I change my mind.” I do not exaggerate when I tell you she flew out of the taxi and directly down the aisle. I’m stunned beyond words. What the heck just happened? Had I crossed into the Twilight Zone? As it turns out, she hadn’t added “get the bride to the venue” on anyone’s list. Therefore, nobody did. Problem was, the list had things like ‘pick up car, take to hotel’, ‘cell phones are off limits’ and other similar ‘dos & don’ts’. The car had been picked up and dropped off at the hotel. And the cell phones had been promptly turned off when they arrived at the venue – rendering the bride’s calls for help completely useless. No car. No phone. No clue what to do next. Next idea? Call a taxi. Then wait. Now… who gets to be mad at whom? I don’t think there’s a flowchart for that one. Lists… they can be good for keeping order and useful tools. They can also turn the best of intentions into the worst of outcomes. Use them wisely. Choosing a Wedding Venue: Renter or Owner? You’ve probably heard that there is a recession going on. Those of us providing wedding services have also experienced a direct hit with the shifting of the mood — and with many wedding planning traditions. Couples planning weddings are becoming afraid to plan ahead for fear that the very services and resources they are contracting for (and paying deposits for) will disappear before the big day. Unfortunately, it is a fear that often becomes a reality. It has become accepted wisdom to plan early and book well ahead of time, especially when it comes to a couple’s choice of venue. However, the shaky economy has claimed many victims, including many owners of buildings and facilities that offered settings for weddings. If a wedding venue occupies a rented space, and the landlord does not or cannot pay the mortgage on the property in question, a wedding venue operator who is completely current on the rent (paid to the landlord, who hasn’t paid the mortgage) can find the door locked on even the most thriving of businesses. It is a scene that is becoming more and more familiar to frantic brides and grooms, and one that is causing couples to be understandably reluctant to tie up precious wedding money in advance deposits, and so forth. The “pay but no payback” phenomenon is not just peculiar to wedding venues, either. Bridal shops are closing by the dozens, and dresses are being held hostage while wedding dates come and go, and financial messes are sorted out. It is small comfort to a bride to learn that she may eventually get pennies on the dollar back for a dress that she already considered her own, and that clearly was not. Florists, wedding cake bakers, and caterers have also staggered under the realities of the recession. You are safe planning your wedding with us, and entrusting us with one of the most important events of your life. When we say “our door is always open,” we mean exactly that.